There are many ways to discover Scotland. You can tour the wonderful countryside via car, reach the Outer Hebrides via ferry, fly from Aberdeen to the Shetland Islands, catch a bus between Edinburgh and Glasgow, or sit back and relax on a steam train journey from Fort William. 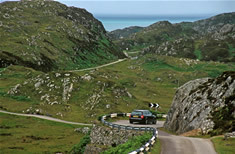 Scotland offers a variety of transportation options for you to reach your self-catering holiday accommodation.